Big disappointment after seeing the other two movies which were great. This movie was a terrible film. No follow through as to the style of how Pegg's character derives his action plan by imagining it in his head first, acting on it, then reimagining it, then moving forward. Just like the other two movies. It was not funny, boring, I did something else to stop from falling asleep. What a sad, pathetic movie! Not funny, at all, and without a spoiler, this plot's been done many times before. My friends raved about this movie about how good it was... I'm a bit disappointed. not as funny or entertaining as the first or second. Not a fan. Not funny at all. I'll just put it straight, I loved this movie. Shaun of the Dead and Hot Fuzz are also amazing, but this movie was so incredibly fun! I wasn't really that hyped for it, but I got one of the best surprises all year!!! THE GOOD: Constant hilarious jokes, great characters, perfect soundtrack, good pace, excellent twists, intelligent and funny writing, well shot, perfect acting, standing-ovation-worthy moments. 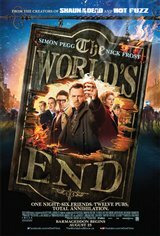 There was nothing bad I could find about this film except for the ending, which came too quickly ;) OVERALL: The World's End is the best comedy of 2013 and one of the best in the past few years! See it if you love to laugh and are in the mood for an awesome time at the movies!